A rendering of the proposed Skyview senior housing project at 1600 Cooly. An affordable housing project designed for seniors won the support of a City Council committee on Wednesday, with members agreeing the proposed development would meet a community housing need. 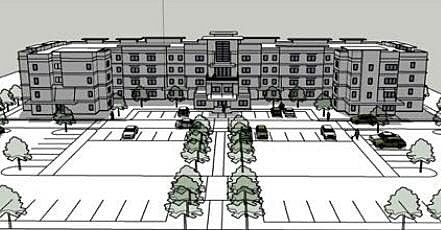 Now, with a contract on the property once occupied by Skyview Trailer Park in place, the developers will apply for the housing tax credits needed to fund the 102-unit apartment project. The project at 1600 Cooley in the Westside neighborhood would include 62 one-bedroom units and 40 two-bedroom units. Rent would range from $525 to $780 for one bedroom and $790 to $865 for two. All utilities are included in the rent, which is set by Housing and Urban Development based upon the area median income. That’s $19,000 to $29,000 for one person, and $22,000 to $33,000 for two. The property’s most recent use as a trailer park and the events that played out last winter haven’t faded from memory. Residents of the park received eviction notices in October, setting off a scramble to relocate them through other housing options. Burkhalter said Housing Solutions discovered the Cooley property in April and met with the owner in May. Given the property’s location, it would have fetched a high dollar. Housing officials also feared that any future development would have sold or rented for market rates. Yet while replacing the trailer park with rent-controlled housing for seniors may lessen the pain of the park’s displaced residents, it doesn’t shed all of it. “In the housing climate in Missoula, it’s been really hard for us because we know the people who lived there and the kids who came to our program,” said council member Heidi West, who also works for the North Missoula Community Development Corporation. West said many of the Skyview residents found better housing through the Missoula Housing Authority. A few were able to relocate their trailers, though such options are increasingly rare in Missoula. Others are living on the street in fifth-wheel trailers while some, West said, can’t find any help. Plans for the apartment envision a four-story structure offering a range of amenities, including a gym, chapel, patio and card room. Units would include common kitchen amenities, along with air-conditioning, washer and dryer hookups, and ceiling fans. In exchange for receiving tax credits, Housing Solutions must commit to 46 years of rent and income restrictions, and a restrictive covenant will be filed against the project. City Council member Heather Harp lauded the project, but encouraged future developers to consider affordable housing for mixed generations.